But the plans can’t go through without MPs voting for it. If enough of us email our MPs urgently today, we can prove to them just how controversial Cameron’s plans are. 74% of the public in Britain are against changes to trespass laws that would allow fracking companies to drill under homes without permission. MPs will already sense that voting for this new law would risk them votes. But we need to up the pressure they are feeling. With less than a year before the General Election MPs will think twice before voting for a controversial law that would give fracking companies the green light to drill under their constituents’ homes. And the more pressure MPs feel right now, as they get back to parliament for the first time this session, the more likely we can stop fracking in the UK for good. It’s official: David Cameron today used the Queen’s Speech to launch his plan to change the law. He wants to rob us of our right to stop fracking firms drilling under our homes. To do it, he’ll have to get the majority of MPs to vote for the plan. But lots of MPs are already unsure about fracking, especially in their own constituencies. We’ve launched an emergency petition to MPs. If they hear from thousands of their voters that we want them to vote against David Cameron’s plan, they will start to understand what a backlash they could face. 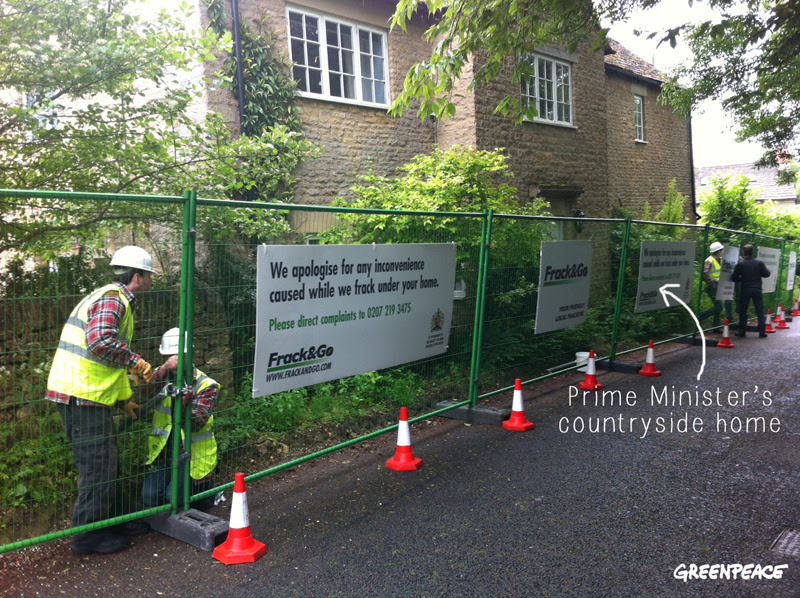 This morning, just before the Queen’s Speech, Greenpeace activists arrived at David Cameron’s very own home and set up a fracking site.